In this ritual I constructed a version of the Harvest Seal with dried plant parts arranged on soil from our garden. I used vervain (Eisenkraut) for the sickle blades and fennel stalks for the sickle handles. The center circle is strewn with aromatic fennel seed. The symbols for the four elements are made out of corresponding herbs: fire – wormwood (Wermut), water – belladonna (Tollkirsche), earth – mugwort (Beifuß) and air – bittersweet nightshade (Bittersüßer Nachtschatten). The forked stang in the center is a dried thorn-apple stem. The triangle at the base (representing the “fifth” element – spirit) is made from dried thorn-apple leaves and seeds. The wooden boxes placed inside the four sickle blades are “seed boxes”, which are pyrographed by hand and filled with seeds from different witch herbs – many of which are gathered by myself and then filled into little bags to be contained in these boxes, which are then shipped to fellow practitioners for sowing in their own witch garden. 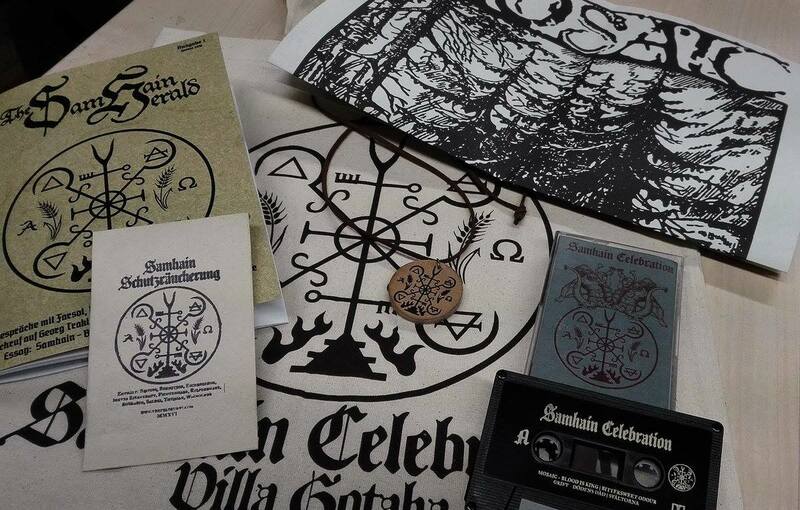 The “Samhain Harvest Seal” was created exclusively for the “Samhain Celebration” in Gotha. It is used as a stage design, on tickets and event related merchandise. In 2017 Austrian artist G. Bergfex of Kvlt&Knochen carved a horse skull with the seal and imbued it with his own blood. The skull crowned the stage, on which Rim Runa, Werian, Forndom, Sun of the Sleepless and Malokarpatan performed. In 2018 Black Arts of Mine created a limited amount of etched copper amulets with a version of the sigil. The old harvest seal has been spreading on the internet and has been mistaken as being in the “public domain” (it is not). People abused it for promoting their events, printed it on t-shirts and other types of merchandise, without bothering to ask me and without knowledge of the context in which it was created. To shed some light and hopefully to prevent future abuse and misuse, I explain here the concept behind the sigil and why it would not be smart to employ it out of context. I created the sigil in 2011 with ink and initially titled it “reaping seal”. It was one of the first sigils I designed for myself. My other sigil designs were inspired by my study of and practical work with traditional “witch herbs”. Before that I had been illustrating occult books. The design plays with harvest symbolism, with sickles and quarters – connected to the four seasons, the four elements and returning cycles. It also carries obvious references to the occult forms and symbols employed within a certain wrathful current. It would hence not be smart to use this seal out of context. I uploaded the digital image to my Pinterest account years ago. I also uploaded (and later deleted) the image to my occult art page on Facebook, as well as a photo of the pyrographed altar table. I later changed the title to “harvest seal”, which does not sound as grim. My artist comment includes the note that I am the creator and do not wish for my work to be used without permission. Most of the time people respect this wish. But apparently some people are ignorant of this – from changing or deleting the original artist comment, to downloading and re-uploading, this way erasing all traces of the original source. Low resolution seems to be no obstacle either, because the smallest image can be vectorized and printed. Due to this (and because the sigil seems to be really popular) it has sadly become one of my most stolen artworks. 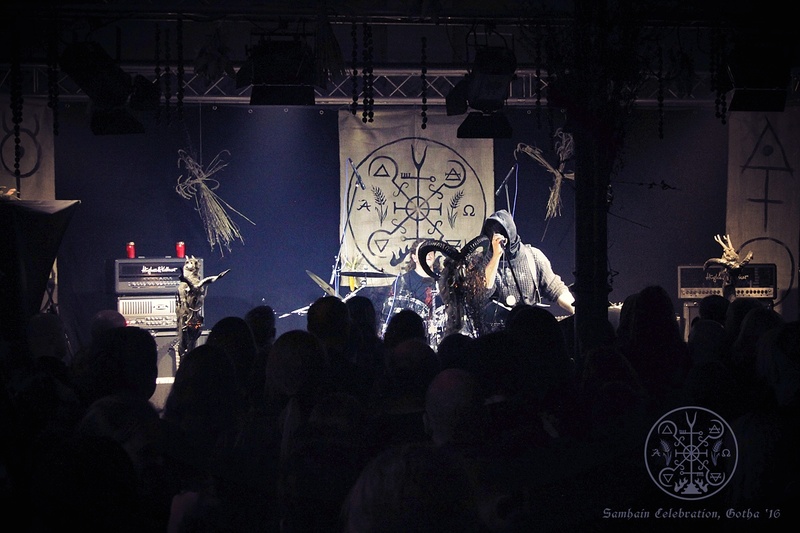 From witches printing it on their products to bands using it on their merchandise or for advertising events – it has happened and continues to happen. Once some band even claimed illustration work of mine as their “graphic designer’s own creation”. But even individuals that bother doing a check-up and search the original artist behind artwork, end up being fooled. It is a strange irony this would concern of all things this sigil the most. The question is not so much, who is to blame, but what to do about it. No longer uploading my work online cannot be the way. Marking all works with ugly watermarks cannot be the way either (especially if the work is already a mark of its own). I am often recommended to employ a lawyer. In the meantime I am thankful that my followers are keeping an eye out and bring art theft to my attention. I am also thankful for everyone that listens and respects my copyright. As it happens to be, once the connection is made, I sometimes end up with new illustration jobs. So all I can hope for is, that awareness will grow and that more people know about me and my work and respect it.